Taking the Coupe route, the Porsche Cayenne Coupe sure looks hot but loses a bit of its practicality. It borrows the same heart as the standard trim – a 3.0-litre turbocharged V6. From sportscars to SUV, any car that wears the Porsche insignia is sure to look stunning. While the new Cayenne looks sporty and imposing, this coupe version, surely take the design game a bit further. The Cayenne Coupe is more or less identical to the standard trim, except of course, the steep roof that smoothly lends into the tailgate. The edge of the roof at the back is nearly 20mm lower than the standard model. Like most coupes, expect the boot space and rear headroom on this a bit compromised. To build the Cayenne Coupe, Porsche had to redesign the rear doors and quarter panels. Thanks to these changes, the Cayenne Coupe looks wider. Porsche claims the Cayenne Coupe to be the sportiest looking model in the segment. At the heart, the Cayenne Coupe has been plonked with the same motors as the standard model. It gets a 3.0-litre turbocharged V6 that develops 335bhp and a 4.0-litre twin turbo V8 that puts out 545bhp. The former does the 0-100km/h dash in just 6 seconds, while the more powerful engine dismisses it in 3.9 seconds. While the Porsche Cayenne Turbo was the first SUV in the world to have an active aero package, this one gets another one under the tailgate glass. At speeds of over 90km/h, it extends out to increase the downforce on the rear axle. 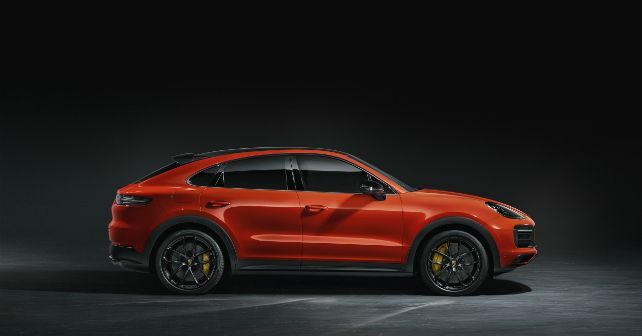 The Cayenne Coupe is also expected to have Porsche Active Suspension Management (PASM), speed sensitive steering, Sports Chrono package and more. Here in India, Porsche Cayenne starts at Rs 1.19 crore. Porsche hasn’t confirmed the launch of the Coupe in India as yet. Even if it does make its way to India, the Cayenne Coupe will only get here in 2020.